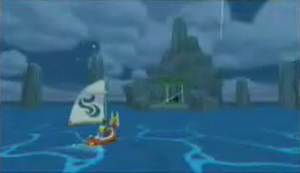 In The Wind Waker, the Great Sea is divided into 49 equal square sectors, and arranged in a 7×7 square. The islands listed below are arranged as they appear on the map of the Great Sea in the game. Islands of particular importance to the plot are listed in bold. There is a difference between the island information here and side-quests. Items to be gained, locations of submarines, secrets caves, and Merman hints are discussed here (among many other things). However, longer character interactions leading to items, and trading sequences are not mentioned here, but on the Side-quests page. Also, dungeon info and items are not discussed here, but on the Walkthrough pages. Merman: "I hear there's a fellow on Windfall Island who's collecting Skull Necklaces. You know who it is, fry? I don't. Sorry. What I CAN tell you is that those piggish monsters you see here in the Forsaken Fortress seem to carry those Skull Necklaces around all the time. Not that I think it's easy work stealing anything from the likes of those guys." This island fortress was once home to a gang of pirates (Tetra's competitors), but is now Ganon's hideout. You visit twice in the main storyline, once near the beginning and again after getting the Master Sword. The interior is really a dungeon, complete with Dungeon Map and Compass, though it has outdoor parts as well. Piece of Heart: Go to room at the southern end, then step on a switch hidden behind some barrels to open a jail cell. Finally, open the chest inside the cell. Merman: "I hear that somewhere out in the wild world is a handy arrow that can freeze anything. With something like that, you could even freeze that nasty monster in the Forsaken Fortress... for awhile anyway. But then, what would you do with a frozen monster, you say? Good question, fry. Why, I'd say that you'd give that thing a whack and watch it shatter into teeny-tiny pieces!" Star Island is shaped like a small, six-pointed star with boulders on each point. Defended by Bokoblins, get Golden Feather. Blow up the southwestern boulder to uncover the entrance. Battle waves of Magtails, Bokoblins, and Moblins to make a chest appear. Get Piece of Heart. Blue Chu Jelly: Drops from the Blue Chu Chu under the southeast boulder; use a bomb to clear the boulder. Merman: "The little shop master on Windfall Island apparently got his hands on a truly amazing treasure. He calls it Magic Armor or something like that. It's a pretty cool magical relic, from what I've heard. If you want him to give it to you, try staring deep into his eyes and winning him over with flattery, fry! Ahhhh ha ha ha ha ha ha ha ha!" This is a small island with a shell on top. A great fairy lives in a secret cave inside the shell. Northwest of the island, defeat Moblins, then swing on the lamp rope to reach the far cabin and get Treasure Chart #22. Blue Chu Jelly: Drops from the Blue Chu Chu. Old Man Ho Ho: Looking at submarine. Merman: "Are you thinking you want to get into that cave, small fry? The one that's protected by the crazy winds on that island? Heh heh heh! OK, then. Let me just tell you a little secret... if you go five squares south and one square east from here, you'll reach Ice Ring Isle, where you'll find an item that will make you as heavy as stone. If you get that item, you won't have to worry about being blown over by the winds." This rocky island is the location of the Wind Temple dungeon which is found behind the gust-blowing statue. You visit this as part of the main story after getting the Iron Boots. Merman: "You'd best be careful sailing these waters on nights when the moon is full. Well, if you like pure soul-freezing horror, fry,then maybe you can handle it." This small rock is shaped like a crescent moon. 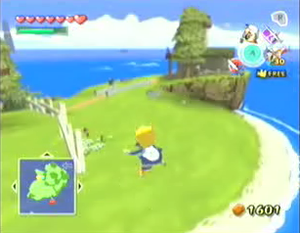 Surrounding the island are many small wooden platforms holding jars with rupees inside. The only way for Link to obtain these rupees is to break the jars from afar with the Hero's Bow. Northeast of the island, defeat Miniblins to lower ladder to far cabin. Get Treasure Chart #9. Treasure Chart #10: In a chest on the island. Blue Chu Jelly x2: Drops from the Blue Chu Chus near the chest. Merman: "If you see seagulls flying around some sea waters, that's a sign that you need to be wary, fry. Because the seagulls flock wherever Big Octos appear. I tell you! Those things don't mess around!" A set of five stone spires arranged like the Big Dipper. 12 Eyes, SW of island. Get Piece of Heart. Merman: "Hey small fry, do you know about the golden Triumph Forks? They're there, I tell you... on that island... the chart is there, is what I mean to say. But the cliff face rises sharply, and even if you wanted to climb it, there aren't any ledges or footings for you to grab onto. So what are you going to do, small fry?" Link using the Hookshot at Overlook Island. This island is a set of small towers rising out of the ocean. The only way to reach the top of these tower is using the Hookshot. The entrance is on top of the second highest tower. 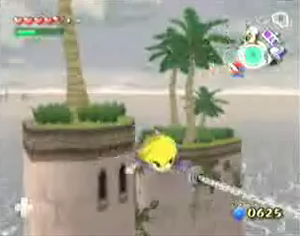 Hookshot to the the top of the lowest island using the tree, then continue using the hookshot to go from tower to tower. The entrance opens into a room with six doors. You need to get into the one opposite where you enter, but it's locked. Defeat the enemies in each of the four side rooms, then round of four Darknuts in the central room to open the locked door. Play Wind's Requiem on the blue symbol to make a chest appear. Merman: "You've seen those weird rings of light that appear on the surface of the sea, haven't you, small fry? Did you know that some of those rings only appear night? Didn't think so." One of the six Reefs. Treasure Chart #19: In a chest revealed by destroying enemies in the lagoon. Merman: "They say that inside the ring of rocks that makes up the perimeter of that island, there lives an incredibly beautiful fairy. But the thing is, nobody's ever met her. Supposedly, the only way you'll ever meet her is to take a ride on a whirlwind and drop inside that rock perimeter from above. Doesn't sound easy, fry." This is a pair of islands, a large one with high cliffs around it and a smaller one you can land on. The Queen of Fairies can be found in the inner grotto of the larger island, but the way you can reach the place is by warping there using the Ballad of Gales. The queen gives you Fire and Ice Arrows, but only after you save Aryll from the Forsaken Fortress (see Walkthrough). Blue Chu Jelly: Drops from the Blue Chu Chu, Child island. Merman: "Beware the night when the crescent moon faces up. That's all I can tell you, small fry." An island with two circular halves connected by a bridge, making it resemble a pair of spectacles. See the Side-quests page for instructions on how to play the Target Shooting minigame here. Blue Chu Jelly: Drops from the Blue Chu Chu, under bridge. Piece of Heart: Prize 1 of target shooting minigame. Treasure Chart #17: Prize 2 of target shooting minigame. Orange Rupee: Additional prize of target shooting minigame. Merman: "Out on the cape of this island is this crazy dancing fool who can't tell you day from night! The guy's nuts...but you've got to respect someone who's not afraid to just let it all hang out like that, you know? I've been watching him, thinking I'd try to learn that dance and compete with him from out here in the ocean... But I just can't seem to swing with that crazy, funky rhythm of his. That guy's incredible!" Though small, the village on this island is home to most of the human population in the game. As such, you visit here several times as part of the main story (see the Walkthrough) and there are numerous side-quests page and minigames to complete here. The auction is held at night. There are four items for sale and after getting the all four the auction closes. If you lose an auction you can come back an re-bid for it later. Piece of Heart: Talk to the man in orange after lighting the lighthouse. Treasure Chart #33: Take a picture (in color) of the woman in orange near the potion shop and show it to her. Treasure Chart #2: After the second visit to the Forsaken Fortress, show Skull Necklaces to Maggie's father and trade 20 for the chart. Treasure Chart #31: Take a picture (in color) of the full moon and show it to the gloomy man in purple sitting on the steps. Magic Armor: From Zunari as part of the Travelling Merchant sidequest. Piece of Heart: Maggie's true love sidequest. Piece of Heart: Part of Killer Bee sidequest. Joy Pendant: Part of Killer Bee sidequest. Cabana Deed: Trade 20 Joy Pendants to Mrs. Marie. Hero's Charm: Trade and additional 20 Joy Pendants to Mrs. Marie. Empty Bottle: Mila's mischief sidequest. Piece of Heart: Playing Cupid sidequest. Piece of Heart: Joyous volunteers sidequest. Treasure Chart #29: Chest in Lenzo's shop, 'Restoring the windmill and lighthouse' sidequest. Purple Rupee: Chest in Lenzo's shop, 'Restoring the windmill and lighthouse' sidequest. Piece of Heart: Reward for 'Restoring the windmill and lighthouse' sidequest. Piece of Heart: Chest on island near bomb shop, 'Restoring the windmill and lighthouse' sidequest. Treasure Chart #24: Reward for 'Lanzo's secret' sidequest. Merman: "Do you know what a ChuChu is, small fry? No, I'm not talking about the sound you make when you kiss somone! I'm talking about ChuChus! They're those slimy, monster-like puddles of goo that turn into blobs of jelly, stand up, and start jumping at you like crazy when you came near them. Well, in any case, there's lots of them on that island over there, so if you see any, I'd avoid them. They can get...nasty. Now that I think about it, every once and a while I see the potion brewer who lives on Windfall Island come here... Now why would he do that, fry?" This is a small island with four smaller island nearby making it look like a paw print from above. To enter, crawl into the the small opening in the side of the dome; it's hidden in the grass. You need Bombs to reach everything inside, so you might as well postpone exploration until you have them. Use the hookshot with the strange looking tree on one of the toe islands to reach the entrance. Battle Wizrobes and the creatures they spawn to make a chest appear. Merman: "There's a real peculiar cave toward the backside of this here Dragon Roost Island. Yeah, real peculiar. But I'll doubt you'll ever get there to see it, small fry- unless you manage to sprout wings and fly, that is... 'Cause you won't be getting there otherwise!" This island is the home of the Rito, a race of bird-men who earn an income by delivering mail throughout the islands. It's also the location of the Dragon Roost Cavern dungeon (see the Walkthrough). Bottle: Obtained in main story line. Red Rupee: Reward for Letter Sorting minigame. Piece of Heart: Reward for Letter Sorting minigame. Purple Rupee: Chest inside the secret cave. Orange Rupee: From the ledge on the upper floor glide to the left to the top of a pinnacle of rock. Continue to the next pinnacle and on to the entrance of a cave. Check the chest inside the cave. Silver rupee: Shoot the trail of bombs on the cliff face in front of the island, then open the chest that falls to the ground. Merman: "To the west of here, over on Dragon Roost Island, you'll see all kinds of rocks. Big ones, little ones...you get the picture. Anyway, they say that long ago, there used to be treasure hidden inside these things. Who knows? There may still be some left, so you should open your eyes and take a good look around...from as high-up as the sun to as low-down as your toes!" This is a launch point the Rito built to practice their flying skills. You can try your luck here with the Bird-Man Contest minigame. (Arrows recommended) Fight Wizrobes and other creatures to make a ladder to the far cabin appear, get Platform Chart. Piece of Heart: Beat record flight in the Bird-Man contest. Merman: "I hear the bird-people who live on Dragon Roost Island east of here have invented an incredibly useful device that they call a Grappling Hook.... No lie, fry! I hear you can throw that thing at monsters and use it to grab treasure they've hidden in their pockets. Talk about cool. Oh, and have you seen those imp-like creatures called Bokoblins that hang out on the lookout platforms at sea and stare through their telescopes? I hear those guys keep Joy Pendants hidden in the pockets, so if you get one of those Grappling Hooks, you can use it to swipe their pendants! " Get increased arrow capacity (Skull Hammer needed). Defended by Bokoblins. Get Skull Necklace. Merman: "I wonder how long it's been since the light in Windfall's lighthouse went dark... It was quite a grand sight, I tell you, the way that ray of light shone out like a shaft of gold through the cold darkness. I used to gaze at it with dear Gillian... Anyway, I bet if someone could shoot a powerful spark into the top of that lighthouse, it would light up again! Of course, that's just my intuition talking... Then again, you should never doubt a fish's intuition, small fry!" This is a long thing island with a series of rocky platforms. There are boulders blocking the way over these which you can clear with bombs, but if your aim is good it's easier to use your cannon. The entrance is on the last platform. Light the torches and defeat a large number of Keese to make a chest appear. Beedle's Shop — This shop has special, limited tine only items. The easiest way to get all three is to get both wallet upgrades, gather enough Rupees to get all three (about 2350), then enter the shop and buy them all at once. The countdown for the time limit starts when you enter the shop, so don't enter until you have a way to get all the money you need. Merman: "Let me tell you a little something about that island over there, small fry... The guy who lives there is named Tingle, but he won't grow up and act his age. He still dresses like a little kid. That...is not normal. Still, from what I hear, he can decipher maps like nobody's business! It just goes to show that you can't judge a person on appearance alone, fry! Of course, the thing about this Tingle guy is that when it comes to pay his deciphering fee, you'd better be ready to fork over some serious dough. Anyone who doesn't have a deep wallet won't be reading any maps, that's for sure." This is a small island with an odd looking totem pole. At the top is a sculpture or building in the shape of a Fairy's head. Just under it you'll find Tingle, the fairy impersonator you released from jail on Windfall Island. Near the end of the game you'll need him to translate Triforce Charts. Defended by Bokoblins. Defeat cannons to make chests appear, then glide from central platform to other two. 12 Eyes, N of island. Merman: "Let me tell you, something, small fry... The school on that Windfall Island has one gorgeous teacher! But the thing is, this gang of four little hoodlums is always causing trouble for her. Those little delinquents like to cause all sorts of trouble. They go climbing trees and hiding behind buildings instead of going to school... What a bunch of savages. Somebody's got to scold these scoundrels and set them straight for the sake of that poor teacher! You hear me, fry?" A small island with an ancient statue. Place Din's Pearl here. Merman: "Word is, they hold an auction every night over there on Windfall Island. Every night the people gather in the Hall of Wealth to amuse themselves by spending a little money. Ah, the rich! Auctions may be a race to see who can bid the highest, but I'll let you in on a little secret: the key to winning an auction is to be both patient and bold. I'm serious, fry! From what I hear, they get some great things up on that auction block, too... Like heart-shaped stuff, among other things. Maybe that's just a rumor. You should try it out, small fry. You might just like it!" Bomb bag upgrade (bombs needed). Defended by Bokoblins. Defeat enemies to make chest appear, get Boko Baba Seed. Merman: "You see that there volcano that's spweing out lava like there's no tomorrow? Yeah, well, they say there's a great treasure hidden inside that thing. The thing is, everyone who's ever tried to get inside has just been blasted away by the great balls of fire that come sooting off the top. If you want to get inside, you ought to find the island that's one square north and four squares west of here. That's where the power to freeze anything is hidden." This is a volcano with fire spouting from the top. You enter as part of the main story once you get Ice Arrows. Defended by Bokoblins. Defeat cannons to make additional chest appear, get Yellow Rupee, Gold Feather. 8 Eyes, SE of island. Merman: "I wouldn't sail through these seas on nights when the left half of the moon is missing... You'll regret it if you do, fry! I'm warning you! It's not my fault if you get so scared that you can't go to the bathroom at night anymore!" This is a set of stone spires, arranged like the constellation Orion. Merman: "I met a really weird guy on the island due east of here. He had a pack on his back huger than any pack I've ever seen. I mean, it was B-I-G, fry! He said he was looking for treasure, but what does he expect to find in a place like that? I tell you...the guy is completely obsessed!" Treasure Chart #32: In a chest revealed by destroying enemies in the lagoon. Merman: "You should come around these parts on nights when just a wee bit of the keft half of the moon is missing. ... That's when IT appears, fry!" This is the broken remains of the home of Jabun. The island is basically a pile of rubble so there isn't much to explore here. But in the southeast is a cone-shaped island with a path spiraling up to the top, just like Spiral Mountain in Banjo-Kazooie. Piece of Heart: From Goron merchant as part of the Travelling Merchant sidequest. Piece of Heart: Chest in niche on the side of cliff. Climb to the top of the spiral mountain and glide northwest. Merman: "You've seen those weird rinds of light that appear on the seas at night, haven't you? Yeah, well, those are a sure sign that there's treasure in the deeps, fry! But let me tell you, there are some lights that don't always shine. Yeah. There are those special ones that shine like crazy, but only when you open a Treasure Chart! They say that those mark the spots where the greatest treasures are hidden!" Treasure Chart #21: In a chest revealed by destroying enemies in the lagoon. Defended by Bokoblins. Defeat enemies to make chest appear, get Golden Feather. Merman: "They've got a shop over there on Windfall Island- a nice outdoor shop! Did you know that, small fry? And in that shop they've got this really fine safe that looks to be brimming full with riches...and they just leave it sitting outside--day and night! I tell you, one of these days that thing is going to get hauled off by a theif! Mark my words, fry! Of course, if I were to find a theif in the act of theiving, I'd stop the perpetrator right there and catch the rat red-handed! I'm sure if I did, the owner of that shop would thank me. Yeah, he'd ne happy. ...That would be the honest thing to do!" Treasure Chart #26: In a chest revealed by destroying enemies in the lagoon. Defended by Bokoblins. Defeat the cannons to make a chest appear, get Skull Necklace. Bokoblins guard the platform. Fight Moblins to make a ladder to the far cabin appear, get Piece of Heart. Merman: "I've done a fish-fortune on you, small fry, and from what I can tell, it looks like you're fated to come to this place many times. And the keys that control that fate are none other than the lucky items known as the Triumph Forks! Yeah, they're some sort of magical utensils! If you want to learn more about the Triumph Forks, talk to that guy, Tingle! That's what the fish-fortune told me! Now, I knw I may only be a fish, but my fortune telling is uncannily accurate! You'd better believe it, small fry!" This tower is buried beneath the waves until the middle of the game; you can't even talk to the Merman until then. Inside the tower is a dungeon of the same name, and after you've beaten that a portal to the ancient Kingdom of Hyrule opens up. Merman: "Tell me, small fry... Have you ever caught a fairy before? 'Cause from what I've been told, when you've been beaten to a pulp by monsters and such, and you think you've finally met your match... If you've got a fairy with you then you've got nothing to worry about. Don't you wish you had something handy for carrying fairies around with you, fry? If you want one, go south from here until you see a miserable-looking submarine floating on the sea. Look there!" A small island with an ancient statue. Place Farore's Pearl here. Merman: "Tell me, small fry, do you have any of them Golden Feathers? I hear those things are the rage with Rito ladies on Dragon Roost Island these days. They just go ga-ga over them! But the thing is, the only way to get a Golden Feather is to defeat one of those bird-monsters... or so they say. Yup! Rito men who have girlfriends sure have tough lots in life, I tell you!" Defended by Bokoblins. Defeat cannons and enemies to make chests appear. Merman: "You've seen the boats sailing around here with the real huge cannons, right, fry? I bet you those things have their hulls packed with treasure! Of course, if you don't have a cannon yourself there's no way you'll ever sink one of them..."
This is a circular island with a lagoon in the middle and a peninsula to the south. In the middle of the lagoon is a tall spire of rock guarded by Kargoroks. This is blocked by a chunk of ice and you need Fire Arrows to clear it. Inside, find and light the torches to make a chest appear. Piece of Heart: Use a Hyoi Pear to take control of a seagull, then fly into the switch at the top of the rock spire to clear the ring of fire around the chest on the peninsula. Merman: "Tell me, small fry, have you ever heard of the fabled set of Triumph Forks? Well, it's right there, my young fry... On that island... You know... A chart, showing you where to find them... Of course, getting it's the hard part." This isn't really an island so much as a metal fortress in the sea. The entrance is guarded by gunboats, but once inside you can easily get a Triforce Chart. Defended by Bokoblins & Wizrobes (Arrows recommended). Defeat enemies to make a chest appear. Merman: "So tell me, small fry, have you heard about the golden Triumph Forks? There are such things... And there's a chart that'll show you where to find them on that island there. If you want it, try asking that huge, grouchy-looking stone watcher! I doubt you could even budge the thing, though... You've got skinny arms, fry." The ruins of a building are at the top of this island, and in the center is a large stone head. The entrance is under the stone head, you need the Power Bracelets to move it. Defended by Bokoblins. Defeate cannons to make an additional chest appear. Old Man Ho Ho: Looking at the platform. Merman: "A famed pictographer lives far to the north of here in Windfall Island. He's apparently real wise and talented in the ways of pictography. He's even said to have legendary pictographs that he treasures above all other things. He keeps them hidden away in a secret safe, or so they say. By the way, small fry... What exactly is a pictograph, anyway?!" A small island with an ancient statue. Place Nayru's Pearl here. Merman: "So, tell me, small fry... Have you heard of the golden set of Triumph Forks? It's right there, I tell you! A chart that shows you where they are! In that house! If you want it, you'd better go in there and scour the place from floor to ceiling!" This is scenic island with a vacation cabana owned by the school teacher on Windfall Island. She will give you the deed in exchange for Joy Pendants; see the 'Killer Bee Gang' sidequest. When you show the deed at the door, the island becomes "Link's Oasis" and you can go in. 8 Eyes, NW of island. Treasure Chart #27: Chest on top of island, Hookshot needed. Merman: "You ought to come sail these seas on nights when the right half of the moon is missing... It'll give you shivers, fry!" A round island with a long, winding peninsula like a fuse. Defended by Bokoblins. Defeat enemies to make chest appear, get Red Rupee. Under a boulder at the top, use Bombs to get in. Defeat rats and Bokoblins to make chest appear. Merman: "Tell me, small fry, have you ever heard of the golden Triumph Forks? They're there, on that island... Or, atleast, a chart leading to them is there. Where's it hidden, you ask? Well, for that answer you'll have to ask a gull." The main island here has a number of rocky spires guarded by Kargoroks. Next to it is a smaller island with a ledge and upper platform. Stand on the upper platform and Use your bow to eliminate some of the Kargoroks in their nests, then use a Hyoi Pear to take control of a seagull and activate the switches on top of each of the rocky spires. This opens the grate behind the ledge so you can enter the cave. Inside, play Wind's Requiem on the blue symbol to make a chest appear. Blue Chu Jelly: Dropped by Blue Chu Chu on upper level of small island. Merman: "Oh, I've got some great information, small fry! Lucky you! If you use the treasure that's hidden on that island there, the thing that vanishes as soon as you get near it... It won't vanish anymore! You know...IT! I'm talking about IT! That thing that appears on nights when a wee bit of the right hald of the moon is missing! Don't you know what I'm talking about?! IT!" This island is in the shape of a diamond and there are several ledges on top. You need to use the Hookshot to go from ledge to ledge in order to reach the highest level. Entrance is on the the top platform. Inside, navigate the maze of magic pots to reach chests. Blue Chu Jelly: Dropped by Blue Chu Chu on one of the ledges. Merman: "Long Ago, there was this huge fairy who lived to the south of here, in the forest on Outset Island. But now, all that's left is the ruins of the fairy fountain where she lived... It's sort of sad... But to tell you the truth... I hear there still IS a fairy there. Yup! She's still alive and kicking down there, fry!" Treasure Chart #41: In a chest revealed by destroying enemies in the lagoon. Defended by Bokoblins. Get Red Rupee. Merman: "Tell me, small fry, have you ever been caught in one of those cyclones? The wind deity, Cyclos, uses those cyclones to fly across the sea instantaneously, or so I've heard. Could be just a rumor. Boy, if you had that power, you wouldn't have to spend so much time sailing back and forth across the sea all the time. Wouldn't that be nice, fry?" This island looks like a shark from above. There are four switches scattered around: a button, a crystal, a Skull Hammer button, and an Iron Boots button. Press them all within a time limit to lower the fire around the cave. Inside, you must battle a large number of enemies of several types to make a chest appear. Blue Chu Jelly: Dropped by Blue Chu Chu on the upper platform. Ride the whirlwind that appears when you activate the switches to get there. Merman: "Listen up, small fry-this is just between you and me... On Outset Island, buried beneath the black soil...there's some serious treasure. I know it sounds like I'm trying to pull your leg, but I'm serious. Try digging there!" Defended by Bokoblins. Defeat cannons to make chests appear on 3rd platform, then glide from 1st or 2nd platform, get Skull Necklace, Treasure Chart #40. Merman: "There's this amazing treasure inside that freezing ring of ice over there. But even if you wanted it and tried to get inside you'd just be frozen solid as soon as you approached the shore. But...if you go four squares north and three squares west, you'll find the power to melt any ice--no matter how cold! Search for it, small fry!" A statue continuously blows freezing air to keep the island frozen. Go inside (see walkthrough) to get the Iron Boots. There is a secret cave inside; defeat the enemies encased in ice to make a chest appear, get Orange Rupee. Merman: "Just a wee bit north of this island, I've sometimes seen a merchant of incredible girth with a monstrous pack on his back. Now, what could he be doing on that lonely little isle? I tell you, there are some strange folk in the world, fry..."
There are two main islands here. This first is the home of the Great Deku Tree and the Kuroks. The other, only reachable by air, is the Forbidden Woods dungeon. On one of the smaller islands you'll find the Nintendo Gallery where you can turn Pictographs into sculptures with information on the game. Merman: "Hey, small fry, do you know about the Nintendo Gallery? The only way in there is to hit a switch that's way up high on the Forest Haven. But the only way to do THAT would be to bribe one of the gulls by putting a little bait on your head!" There are several small islands and one very tall island. There is a secret cave that connects one of the small islands to the top of the tall island. There is an easy puzzle here to get from the entrance to the exit. Defended by Bokoblins & Wizrobes (arrows recommended). Get Boko Baba Seed. Treasure Chart #25: Chest on top platform, travel through the secret cave to reach. Merman: "On the island due east of here lives an old man who was once a master swordsman. He's got proof of it, too: he has a Knight's Crest. Want to know what that thing is, fry? Well, too bad... I can't go giving away every secret!" As you might expect this island is in the shape of a horseshoe. Once you land, vines prevent you from reaching the other end. Pick up a Deku Nut, throw it past the vines, then use your Deku Leaf to blow the nut into a hole to make the vines go away. You need to do this two more times and it gets harder each time. On the last hole the nut is already on the other side of the vines. A chest appears on a platform in the middle when all the vines are cleared. Sea Hats live on the water here. Guarded by Bokoblins & Kargaroks. Press a button on one platform to make a chest appear on the other, get a Golden Feather and a Skull Necklace. Treasure Chart #8: Drop into hole at the end and defeat mothulas. Treasure Chart #28: Chest on central platform. Old Man Ho Ho: Looking through kaleidoscope. Merman: "I heard that beneath the big-head boulder on top of the hill here on Outset is where the greatest treasures of all, the golden Triumph Forks are buried. But actually, fry, I must have misheard or something... 'Cause this one guy told me that what was actually buried beneath that weird rock was a chart to this shard of something called Triforce. Whoever heard of that? That's crazy! There's a big difference between "Triumph Forks" and "Triforce"! I mean, I think someone intentionally buried something misleading there." This is Link's home and where you start your adventure. There are actually two large islands connected by bridges. Merman: "Small fry, there's a real heavy stone head blocking a cave on that island. Don't you wonder what's behind it? Don't you want to get in there? Heh heh! Let me tell you a secret! If you go north four squares and east three squares to Fire Mountain, you'll find an item that gives you the strength to easily lift anything, no matter how heavy it is. With that thing, you could lift that stone and toss it out of your way as if it were light as a feather." There is a cave leading to the Earth Temple dungeon here, but the entrance is blocked by a giant stone head and you need the Power Bracelets to move it. Defeat the rats inside to get Treasure Chart #14. Merman: "I tell you, lately no one around these waters has seen the beautiful fairy who bestows magic power. She used to live here, fry. All anyone sees anymore are the Bog Octos that have been appearing lately. Maybe they scared her off... Oh no! I sure hope...they didn't eat her!" Treasure Chart #13: In a chest revealed by destroying enemies in the lagoon. 4 Eyes, SW of island. Great Fairy appears and grants you larger magic bar. Merman: "Northeast of here is the Forest Haven... They say a truly unique kind of firefly is indigenous to that place. You heard of it, small fry? It emits bursts of light in seven colors! Supposedly it's as beautiful as the rainbow! If you want to capture one though, you'd best have a bottle to keep it in." There are two islands here made of blocks. Some of the blocks are movable and by solving the puzzle you can reach the top of the larger island. Piece of Heart: Chest at the top of the large island. Merman: "Lemme ask you something, fry... Have you been using [R] to make your boat jump? Well? Have you? ...Of course, going out to sea just to jump around would be real dumb, if you ask me. Anyway, what you can do is tilt <-O-> to move your tiller just as you land... That's how you make a sharp turn. If you didn't know that, what don't you try it out?" There are two islands here. On the south island, talk to the NPC to start the Boating Course minigame. You can reach the north island with a Deku Leaf. The entrance is on the north island. While fending off an endless stream of Miniblins, use your boomerang to activate the three switches in the caves set in the walls. (There is no time limit so just do one at a time.) A chest appears with the Submarine Chart. Blue Chu Jelly: Drops from the Blue Chu Chu, north island. Merman: "Have you seen it, small fry? ...The Ghost Ship? 'Cause it's real. It's even been seen here, in these very waters... On nights when the crescent moon faces down... That's when horror rises..."
This is a set of five stone spires, coincidentally arranged like the constellation Cassiopeia. Each spire is guarded by a Kargorok, so you can farm Golden Feathers here. SW of islands. Destroy the cannons to make a chest appear, get Golden Feather. Bokoblins guard the platform. S of islands. Fight bats and Bokoblins to make a ladder to the far cabin appear, get Piece of Heart. There are six reef type islands consisting of a square shaped enclosed lagoon with a number of little islands, or "eyes", inside corresponding to the number in the island's name. The objective at each one of these reefs is to destroy the enemies in the lagoon: gunboats and cannons that hang from the walls. This makes a chest appear on top of one of the islands. When the chest appears, get out of the boat near the entrance of the lagoon, climb up the ramp to the top of the reef, and follow it around to a high point close to the island with the chest. Adjust the wind direction if needed, then use the Deku Leaf to glide to the island and open the chest. The chest will always contain a Treasure Chart, but for the Cyclops Reef the chart is for the same location so pick up the treasure while your there. The treasure chart for the other reefs leads to the inside of the lagoon so, to avoid fighting the enemies twice, it's a good idea to get the chart for the reef first when possible. So, for example, before doing Three-Eye Reef (D1), first get Treasure Chart #38 (at the auction), then open the treasure for it while you're at the reef getting Treasure Chart #32. This page was last edited on 31 January 2017, at 17:08. This page has been accessed 54,414 times.